After immersing ourselves in Shaiva philosophy at the Kapaleeshwara Temple in Chennai, we journeyed for darshan to the Varadaraja Perumal Temple in Kanchipuram. 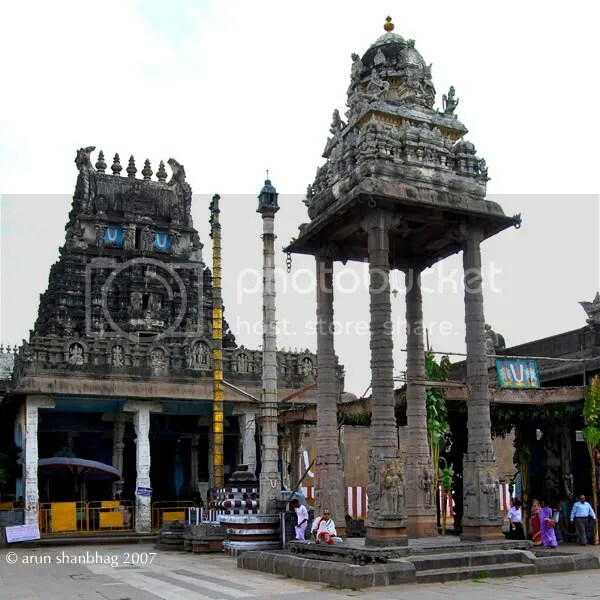 This temple was commissioned by the Pallava King Nandivarman II and built circa 770 ce. Then Kanchipuram was the capital city of the Pallava dynasty and at the cross-roads of the North – South trade within India. Through their port city at Mammalapuram, trade and Indian civilization were spread across the bay into Thailand, Cambuja (Cambodia), Shrivijaya (Malaysia, Sumatra and Java) and present day Vietnam. 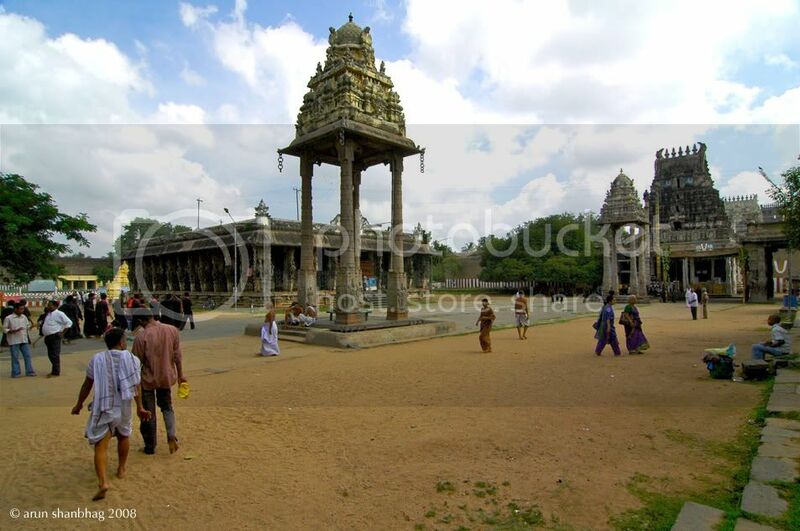 The thriving Kanchipuram was also a seat of Sanskrit literature and Buddhist, Jaina, Vaishnava and Shaiva philosophies. The Varadaraja (aka Venkatanatha or Vaikuntha) Perumal is a stunningly magnificent temple, where a resplendent Vishnu, seated on a throne, holds court. 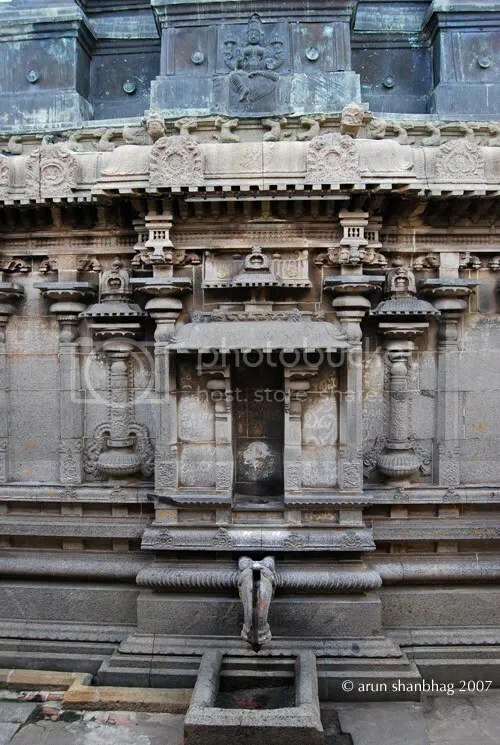 The pic above is of the courtyard inside the main gopuram and leading towards the inner courtyard. On the right, you spy my mother leading M to the shade. In the background, note the multi-pillared kalyana mandapa – a hall for weddings. You also notice a group of Ayyapa devotees clad in black, making their way towards the inner courtyard. We visited Kanchipuram in early Decemeber, which coincided with the annual pilgrimage made by Ayyapa devotees as they journey towards Sabarimala in Kerala. It was heartening to see tens of thousands of these devotees during our yatra. Encountering these devotees, by their penance and sacrifice, sanctified our own pilgrimage. Working our way towards the inner courtyard, in the pic below, notice a smaller mandapa used during festivals to sport the divine murti in a swing. Following this mandapa (someone please suggest a name) is the deepa sthamba (light post), a balli piTha (sacrificial stone), the brass coated garuda sthamba (eagle’s perch) and finally the inner gopuram. In addition to artwork in niches of the gopuram, the garuda sthampa identifies this as a Vishnu temple – the eagle is Vishnu’s vahana – ride. Shiva temples will instead pay tribute to a Nandi (bull) out front. Devotees throng through a doorway. Notice the Lakshmi on the lintel, showering her grace on all who pass through; a common feature in all temples and many homes. 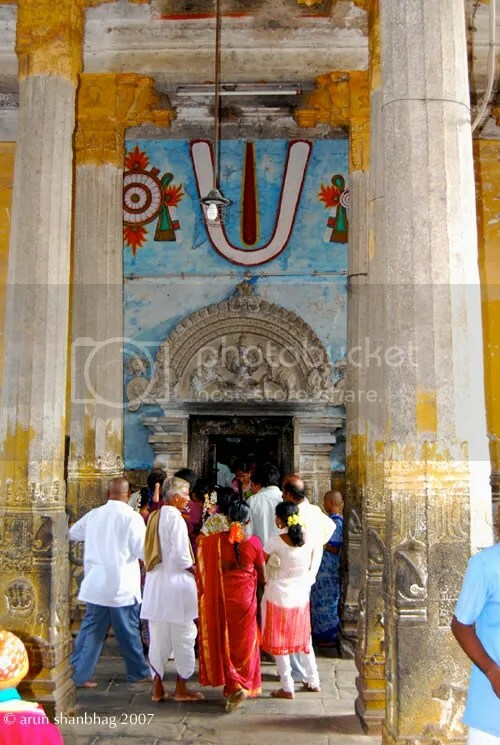 After darshan, we walked around the garbha griha (womb chamber housing the murti) along this narrow pradakshina paatha – a corridor created by the outer wall of the sanctum and the inner courtyard. The sanctum is artistically sculpted and later decorated with various deities in relief on metal sheeting. Uniquely, the temple has three storeys with other Vishnu murtis in stacked sancta. This arrangement of sancta also attests to the antiquity of this temple. In the early history of temple architecture, artisans (along with their royal patrons) experimented with this concept. I was fortunate to see another example of a two-storey, Chalukyan Vishnu temple in Aihole, Karnataka. 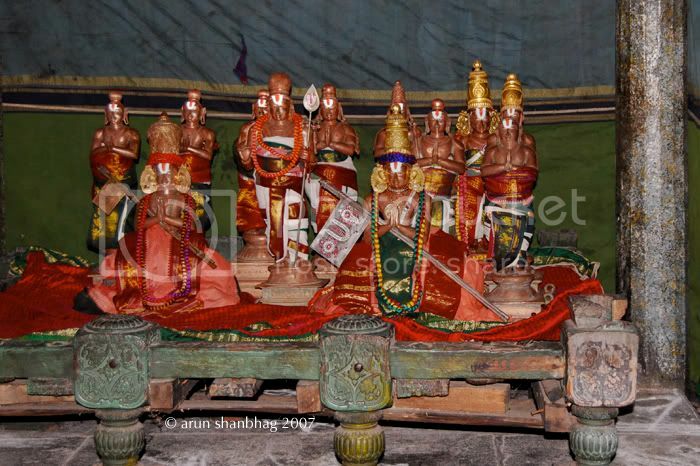 While murti pujas are no longer performed in the sancta above, a throng of Alvars – Vaishnava saints – are frozen in devotion across from the upper sancta. In one of the upper chambers is a giant golden lizard. Makeshift ladders permit devotees to touch the lizard. 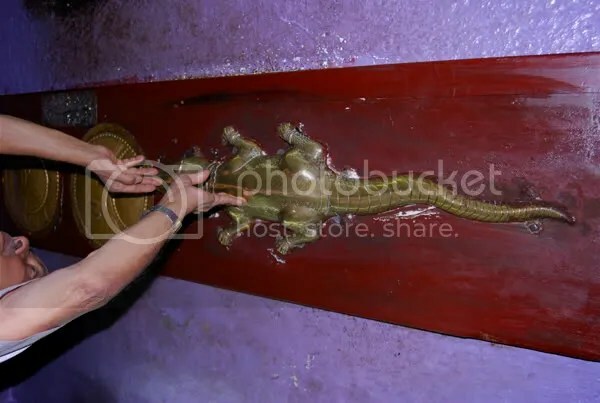 Devotees believe that touching the lizard in this sanctified chamber absolves us of the sin of previously hurting lizards; it also protects us from future harm by lizards. Here’s my father reaching for the lizard. Thank you for sharing that link. will you please give the Postal address of kanchi varadarajaswamy perumal Temple i need to send marriage invitation for gods blessings. What a beautiful idea to send a wedding invitation to VaradaRaja himself. Unfortunately, I do not have their mailing address and am currently based in Boston, MA. and enclose a short note. You don’t need ANY money to get darshan. ALL darshans are free. Just go. After you return, please share your experiences. Please do; its a beautiful temple. Glad to see increasing web presence of info on Varadaraja Perumal and temples around which was not the case earlier. Although post is dated ’08 it stands relevant. Nice work Arunji and good to see your prompt replies to comments. God bless. Take care. It is a beautiful temple and has graced us all for centuries. I hope we can document all the rich symbols of our heritage.